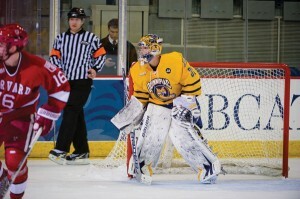 Quinnipiac senior goalie Dan Clarke signed with the American Hockey League’s (AHL) Bridgeport Sound Tigers, the top affiliate of the National Hockey League’s (NHL) New York Islanders. In his last season with the Bobcats, Clarke went 8-3-0 with a 2.37 goals against average (GAA) and a .895 save percentage. His best year came as a sophomore, when he was named Quinnipiac’s Most Valuable Player after going 15-15-2 with a .913 save percentage and a 2.52 GAA. During his sophomore year, he went 7-0-0 in November, making him the first ECAC Hockey goalie to earn Hockey Commissioner’s Association (HCA) Player of the Month honors. Clarke finished his collegiate career with a 32-32-5 record with a 2.62 GAA average and .902 save percentage. 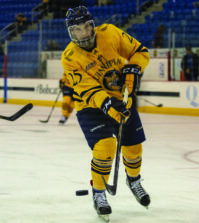 His 32 wins as well as his GAA rank third in Quinnipiac’s Division 1 history. Clarke also had five shutouts as a Bobcat which is also third all-time. Clarke signed with Bridgeport due to one of the Sound Tigers’ goalies going down with an injury. 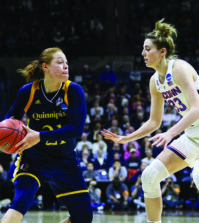 Before arriving at Quinnipiac, Clarke played for the Bowmanville (Ont.) Eagles of the Ontario Provincial Junior Hockey League. He played eight games with the team, going 5-2-1 with a 2.08 goals-against average and a .938 save percentage. Clarke won Playoff Most Valuable Player honors with Bowmanville during the 2007-08 season. Compared to ECAC Hockey play, Clarke said that AHL competition is different from college. Clarke’s signing with the Sound Tigers comes two days after senior captain Scott Zurevinski signed with the AHL’s St. John’s IceCaps. 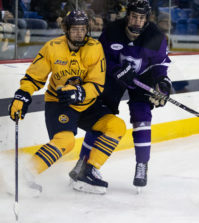 Zurevinski and Clarke currently represent two of the 10 former Quinnipiac players who play professionally for the AHL and ECHL this season. 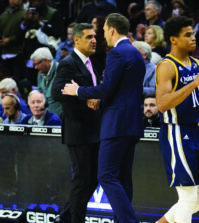 Some of Clarke’s teammates from his previous four years at Quinnipiac and several coaches have contacted him to wish him luck.